Sri Lanka’s second most ancient kingdom is Polonnaruwa. It became the island-nation’s capital city in 1070 AD after King Vijayabahu I defeated the Chola invaders and reunited the island under one local leader. This mystical ancient city is a UNESCO World Heritage Site, which means its host country must guarantee its protection and preservation for future generations to enjoy. Located in the country’s north-central province, Polonnaruwa is the second largest city in the province and certainly one of the cleanest and most beautiful. Local and foreign tourists regularly come here to see many ancient remains and tourist attractions. One of them is an old irrigation tank called Parakrama Samudra by King Parakramabahu the Great. Construction of this vast irrigation project during its time is difficult to imagine. The tank is 15-km2 wide and the dam is 12 meters high and almost 14 kilometers long. It is truly a majestic site today as it was during the king’s time. To enjoy the view of his own creation, King Parakramabahu constructed a rest house and an island garden called Dipuyyana. Later kings loved this garden as well and set their own palaces and council chambers there. The lavish King Parakramabahu also built a palace, whose remains still stand today. The original palace must have been magnificent. Historic literatures describe it as being “seven stories high, furnished with a thousand chambers”. Today, visitors can still see and walk inside a great hall, probably an audience hall, 31 meters long and 13 meters wide. Near the palace is the king’s council chamber. It is ornately furbished with pillars, lion portals and a moonstone, and supported by a base with bas-relief elephants. Each elephant was carved differently from the other. Another attraction is Kumara Pokuna, the royal bath. This bath is believed to have been a part of Parakramabahu’s Royal Pleasure Garden. It is believed that the waters that used to flow into the bath were perfumed. Along the sides are solid masses of stone which served as a water cooler that gave the king the most refreshing baths despite the searing tropical heat. Other attractions are a Hindu temple dedicated to the Hindu god, Siva; the Thuparama, a large Buddhist image house; the Nissanka Lata Mandapaya pavilion; Satmahal Prasada, a pyramidal tower, almost like a ziggurat, with seven tiers that each has a figure of a deity; Hatadage or the Shrine of Sixty Relics; Gal Potha or Stone Book, which is a massive slab of stone wherein inscriptions of the deeds of King Nissankamalla are found; Pabulu Vehera stupa; and Siva Devale 2, a Hindu temple that is clearly the oldest identifiable building in Polonnaruwa. These are just a few of the sights that wow visitors as they come. 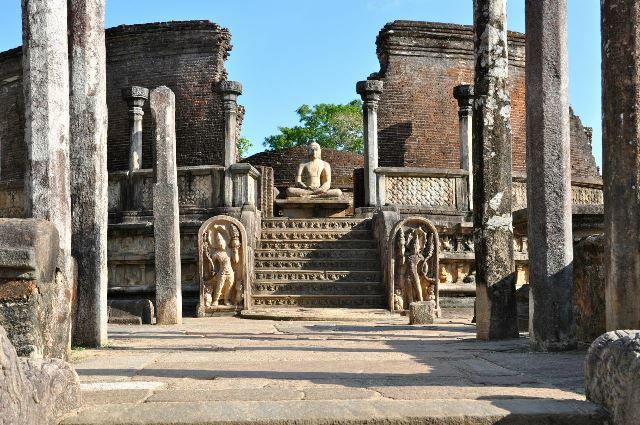 No doubt tourists, historians and archeology enthusiasts will have a heyday in Polonnaruwa. There are several major and budget hotels and modern facilities to satisfy tourists. There are also shops, bars and restaurants, as well as government institutions and the Polonnaruwa Royal Central College, the largest school in the district. Locals are used to receiving so many foreign tourists, which is why they are very friendly and accommodating. Western tourists also enjoy the fact that the town is cooler than most parts of the country.